Improving it could be true if you take the lossless file as a source. If you only have the MP3's after conversion, please don't transcode them. Quality will suffer, no matter what bitrate. Well, I do understand that this is an Opus thread, but... after reading Brand's post, I got curious, so I just had to test it. However, in my own personal point of view, I still consider Opus as technologically superior to AAC in many if not all aspects. I am not trying to make Opus sound bad (how could I? It doesn't even sound bad!) but I just pointed out my personal observations. I never meant to make anybody feel bad. I think I got the idea: thank you for the explanation. Don't worry: I won't transcode my MP3 files. I only convert my FLAC files to play them on my mobile phone. 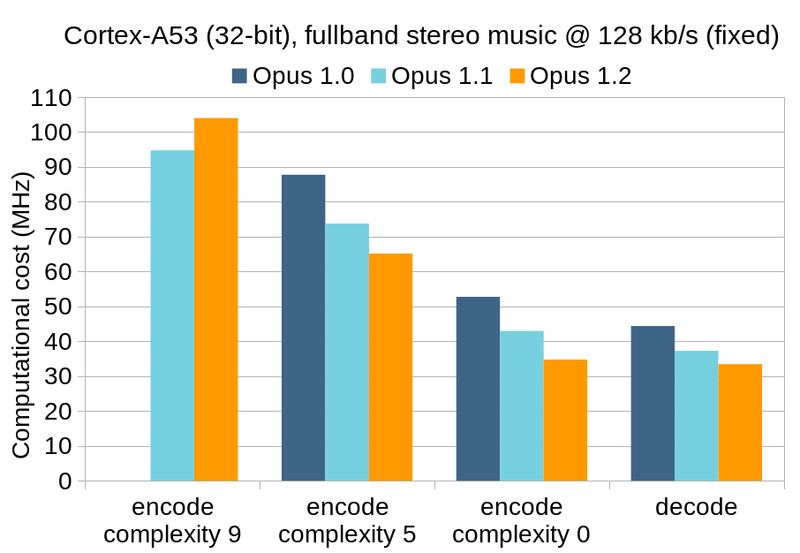 It seems Opus is the codec to use, so I'll stick to my plan and I'll use Opus @ 128 Kbps next time I need small audio files. It's worth to mention that there were quality improvements at 64 kbps and somewhat higher too. Why ther is no Win-32 build on the official download page? Maybe this difference is because of 32 and 64 bits or Raspberry Pi 3 is rather slow. P.S. It's also interesting that an encoder requires ~50 MHz (x86) for 1 channel speech 16 kHz @ 12 kbps. But it takes less (~35 MHz) for 2 channels, 48 kHz @ 128 kbps. At least some of this would be the difference between 32-bit and 64-bit. There could also be compiler differences, the exact song that was used, and other minor things on top. The way SILK is structured, decoding is very cheap, but encoding requires more searching. It's not so much analysis like what CELT does when going from complexity 0 to 10, as just optimizing the decisions to minimize rate-distortion. Are you kidding? I bet there are still more users on 32-bit Windows than there are users on non-Windows desktop OSes. That's at least the data Steam HW survey shows. The average opusenc user is probably a lot more likely to use 64-bit Windows or a non-Windows OS than the average Steam user. 32-bit Windows compiles should still be provided, though. I suppose that both official builds (32- and 64-bit) require Vista and SSE2? There are no 64-bit architectures without SSE2, so that's not an issue. As for the win32 builds, they should work on pretty much anything AFAIK (untested). Does anyone know if there is a 32-bit opus 1.2.1 build with flac input support available? Attached is a generic 32-bit opusenc 1.2.1 with FLAC support that works on Windows XP and has no SSE instruction set requirement. I'm using those builds on my Linux environment with wine in combination with foobar2000 or from the (bash) command line. The flac support is very handy for the latter. You can use a 64-bit Wine prefix (just rename .wine folder in your user home and run 'winecfg' - it should create a 64-bit prefix by default with a recent wine version... or specify the WINEPREFIX environment variable for another folder) and it should work fine. I'm using the binaries provided by Emre (thanks!) in my foobar2000 through wine without issue. i also rebuild opus-tools with flac support and i kept flac.exe and metaflac.exe if anyone want to use it.